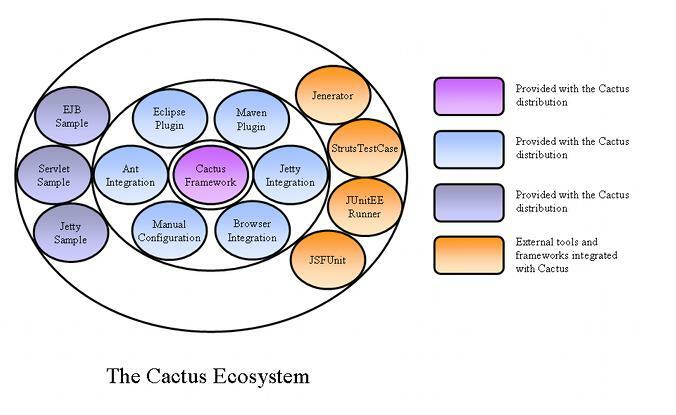 The Cactus Framework: This is the heart of Cactus. It is the engine that provides the API to write Cactus tests. Type 1: code logic unit testing. Probably the best strategy for these tests is to use a Mock Objects type framework. Type 2: integration unit testing. Cactus is typically in this category (we'll let you judge if it is the best or not :)). These tests will exercise the interactions with the container. Type 3: functional unit testing. These unit tests will let you test the returned values from your server code. This is for example HttpUnit (Note that HttpUnit also performs standard functional testing - as opposed to functional unit testing -, which let you test full use cases - a login use case for example, which is comprised of several requests/responses). Ideally you would use 3 different frameworks just to unit test your code ! Then you have to think about acceptance testing, system integration testing, ... Cactus was developed to fit Type 2 but also to be a very good compromise for types 1 and 3, with the idea that it is much easier to have to write tests for a single framework than for several ! Moreover, you can never fully test your code. We believe Cactus provides a middle ground that provides a high confidence that your code will run when deployed. However, it is your choice and you can use Cactus only for type 2 if you wish. To get started, read the Getting Started guide.